We post the hotel name and information on My Profile under the Itinerary section on the left-hand side of the page. If you are unable to see the specific name of the hotel that your group will be staying in, it may be that the details have not yet been released. Typically hotel information is not released until after the final balance date. As we block space nearly a year in advance, once the final payment date passes, we evaluate the group sizes compared to the space we have in each hotel and then assign the hotels. We never separate travelers signed up with the same group/trip code. If you do not have a hotel listed on your profile, do not worry! As soon as we have your group's assigned hotel, you will receive an email to let you know it has been added to your online profile. 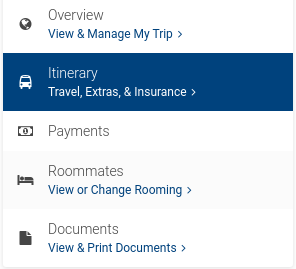 Hotel information can be reviewed at any time through the online profile under the Itinerary section. If you are not booked yet and want to know more information about the hotel, you can input your group's trip code on our website. This will bring you to your personalized trip page with all of the details for your school's trips including hotels, travel details, excursions, price, and more. If you don't know the trip code, reach out to the student organizers from your school.